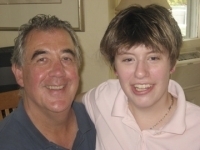 "My inspiration for [with]tv came from lifetime experiences of raising my daughter, Victoria, who was born with developmental disabilities," said Howard Renensland, CEO & Founder of [with]tv. "The moment we are broadcasting, we will overnight change the lives of people with disabilities by providing an authentic window into the community." While [with]tv is still in the start-up stage, Renensland has received support from around the world. Photo: Howard Renensland with his daughter, Victoria. Here is the September Update. So much has happened since our last update. While none of us will be happy until the day we actually launch our channel, myself included, I must tell you in all honesty that we are closer than ever to that day. While it may seem a long time in coming, and I agree, it certainly is, we must recognize the tremendous struggle we have when one considers all the factors aligned against us. The one constant in all of this however, has been, and remains, that everyone with whom we discuss and explain [with]tv to responds positively. They all accept our premise and agree with our mission no matter whether they are in the disability community, investment, business, or media world. We continue to add supporters. I urge everyone to continue to visit our Blog, read our articles, post your own, and to visit our support letter and register your support. The more of your friends and relatives, etc. you can get to do so, the better off we will be.